These Instant-Lite soldering furnaces were sold around 1929-1930 as Coleman attempted to enter the appliance market, a venture severely hindered and eventually discontinued by the Great Depression to instead focus on portable stove units. This furnace, popular with plumbers due to its portability, is a partner to the 454 Utility Burner which was more popular in other trades; however, neither made a lasting impact given society's lack of money. The fount is pure brass, the top includes a drum-shaped metal lid (very rare), and a soldering iron with a wood handle is also included. A unit with the entire set (burner, lid, poker) is very rare and potentially quite valuable. Coleman designed this steaming unit in the early 1930s as a test product. This unit was designed to wet wallpaper for peeling, and around one hundred were made. However, given that the Depression had sunk in, these were a luxury nobody could afford, and home redecorating was at an all-time low. Coleman decided not to continue with them, hence these units have become extremely rare. This small refrigerator/large cooler was made by Coleman, likely in the 1950s or early 1960s. The vintage turquoise door is the rarest part of the unit, as those were only around for a small window of time. It is currently used for storage at the store and has not been used for cooling purposes in several years. This portable washing unit was manufactured in November of 1925 by the Paramount Steam & Washer Company in Kansas City (as can be seen on the top), in conjunction with Coleman of Wichita. Coleman designed the gas tank and the base to allow for a portable, fuel-driven washing machine that was useful for extended travel, including military operations. The centrifuge has an agitator to allow for premium washing even when on the go. Coleman's partnership with the U.S. military led to the development of this four-burner portable stove, called a "field kitchen," which could be attached to the back of an army Jeep for easy transport. It allowed for a convenient way to feed multiple mouths at once near the battlefields of Europe and the Greater Pacific, and has become rare due to its limited numbers and military use. 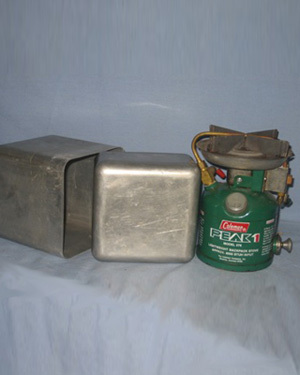 This small stove set can generate 2500 BTUs with its gas burner and two extra generators housed in the detachable gasoline tube. Made in the late 1930s through mid 1940s, it was primarily used to heat dental instruments and is a primary reason why many people became afraid of going to the dentist. This is an original 576 Coleman Peak1 stove, a model still available commonly, albiet this is an older edition. The cook kit case, made by Coleman U.S.A., is much rarer – the two essentially are a set. This stove produces about 8500 BTUs and is ideal for backpacking. Although this stove looks like nothing special, it is, in fact, the worst stove Coleman ever made. Only produced during the first half of 1962, very few remain, as they were recalled due to vaporization problems with the circulator. 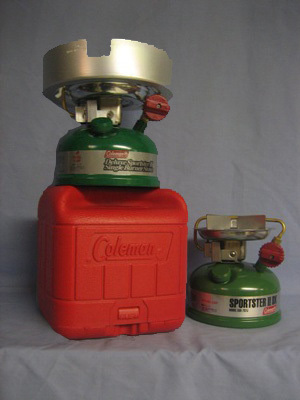 Coleman replaced all recalled units with the redesigned 501A, which fixed the generation problems by rerouting the fuel through the shut-off valve. The mistake that was the 501 helped Coleman continue to perfect its stoves. This one from June 1962 comes with an original case. Partnered with a similar lantern, the Coleman U.S.A. Select-e-Fuel stove, nicknamed the “Corn Stove” is a recent Coleman innovation. This two-burner stove can burn regular fuel, unleaded petroleum gasoline, or ethanol, the latter from which the nickname is derived. The bright yellow gas tank is detachable and can be stored under the burners. This stove was only recently taken out of the box and has never been used. A similar lantern was also manufcatured. The 413H model dates back to the 1980s, but this 413H490J made for the Japanese market is unique – most 413 series stove boxes are painted green, while the aluminum wasn’t for this 413H490J. This two-burner stove is dual-fuel (gas or kerosene) and has never been used. It was manufactured around 2006 and still has its original packaging. These two model 533 Sportster II DX stoves are identical, except the Deluxe version (top) has a protector around the burner, to keep a pot or pan level. These were both manufactured by Coleman U.S.A. for sale in the Japanese market in the 1990s. Both come with the same hard plastic red carrying case and their original packaging. The Deluxe is dated March 1996 and the standard March 1997. It appears that neither has been used. Coleman in Wichita made several stoves for the Japanese market in the 1990s and early 2000s, including this special 502A stove commemorating the company’s 100-year anniversary in 2001. The fount is chrome-plated steel, and the words “100 Years” across the collar are reminiscent of Coleman lanterns from the 1920s and 30s. This stove comes with a soft carrying case for easy transport. This is a blown-up posterboard of an October 1945 Coleman News article entitled, “Marine Captain Sends Jap Lanterns Here for Study,” which details two tiny lanterns discovered at Battle of Saipan and sent to Coleman for analysis. Details about what is presumed to be the only surviving lantern can be found at the “Other lanterns” page. This article covers the basis, and Coleman’s research into these two lanterns, which were presumed to be used by commanders at the Japanese command center on the island, and shows a side-by-side comparison of the two lanterns and Coleman’s smallest at the time. The article also shows prejudice against the Japanese, a reflection of the American mood after Pearl Harbor. What is now a candle holder was once used to house the Olympic Torch's flame on its journey from Athens to Salt Lake City for the 2002 Winter Games. The torch was developed by Coleman, and is the first in the Olympics’ history to incorporate glass. The specifications the torch from the Salt Lake Organizing Committee (SLOC) warranted the use of glass to protect the flame from wind, rain, heat, cold, and eventually snow; it also was to represent the season as well as purity. The design of the entire torch was reflective of the times and of the location; the icicle-shaped unit also contained a fuel tank to ensure the torch continued to burn brightly and efficiently in true Coleman style. About 14,000 in total were made, making this a staple in Coleman collections of the future. This inconspicuous-looking gasoline jug is actually quite rare, as the embossed phrasing “Coleman Toronto” and “Made in Canada” is something not typically seen on Coleman products. According to an old flyer, this can was made of a tin-lead alloy called Terne, and the smartly-designed self-closing cap prevents fuel from evaporating or spilling when dropped. This jug can hold up to a gallon of fuel and was likely painted red at one point; comparable units have stenciled fire hazard warnings as well. This blowtorch was manufactured for Coleman Canada by a company called Butler Metal Products in Preston, Ontario. This #102 seems to be a part of a series of blowtorches Butler made for Coleman, also under the name “Butler Stampings and Machine Screws Ltd.” It is unclear if #102 is the model number or the manufacturing number, as no other #102s have been found. This Porta*Perk portable coffee pot from Trumbower Industries, based in Pardeeville, WI, is made from aluminum and glass. The gas percolator is detachable for easy transport. The box is original. It was likely made in the late 1950s or early 1960s and has been used a few times at most. 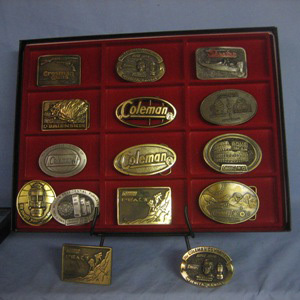 Coleman emblazoned their logo and those of their subsidaries onto brass belt buckles, which have become a collectable item. The collection is incomplete, as it is missing one due to its rarity. Coleman also branded some cigarette lighters, a venture that was short-lived. There are also some miniatures of some classic Coleman lanterns displayed here, as are some coins and badges made with Coleman logos, presumably by Coleman U.S.A.
Several keychains of Coleman lanterns have existed over the years, and all of them are prominently displayed in this custom-made wood dollhouse. There are twenty in all here, and each of them still lights when the dollhouse is plugged in for a warm feel. Nothing really did happen here in 1897. Heck, the store wasn't even built yet. Coleman wasn't even around, but only just barely. Hard to believe that time existed, right? This Neon sign is in the store's front window, letting people know that we carry Coleman products. It has been in our possession for a long time and will be for as long as our family continues to sell Coleman camping gear. In the years following World War II, the Society for Visual Education, among other companies, converted several Coleman 237 lanterns into projectors for use where electricity was not abundant, such as missions or rural classrooms. Chosen for its large size, 500 candlepower and ability to burn either gasoline or kerosene, these units could project slideshows or filmstrips and were innovative technology for their day. The lantern base is dated April 1954 and the unit has never been lit. These two oil paintings (cycling every 5 seconds) of an early-1950s 200A Christmas lantern and an early-1920s 323 lantern were painted in 2002 by Carl R. Tucker, co-author of the Coleman Collector’s Guide: 1903-1954, nicknamed “The Holy Bible of Coleman.” They are painted on canvas wrapped around a wood frame. Both are signed in the lower left-hand corner and are one of a kind. Wisconsin Native American artist Harry Whitehorse carved this totem-pole like statue from the trunk of a tree outside the store. Dated to 2008, it is called "The Voyager." The top is an eagle, the middle is a bear, and the bottom is a man with a mustasche all too familiar. This carving stands guard, deterring any intruders from entering the store to steal valuable collection pieces.